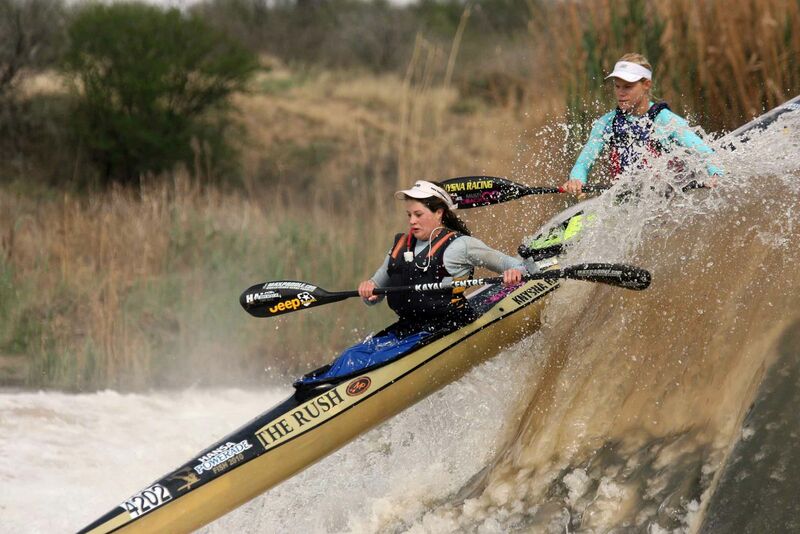 The Hansa Powerade Fish River Marathon is definitely one of my favourite events on the calendar! The organisation is superb, the race is awesome, and the after-party good fun. What more could you ask for in a race? We hopped in the boat for the first time ever on Wednesday, and shot Soutpans Rapid. It went well, and we combined nicely. Robyn was going to drive, as I felt that A) she is probably better at it than me! and B) being so tired, it helped giving her the responsibility of driving, leaving me to focus on getting the boat moving. 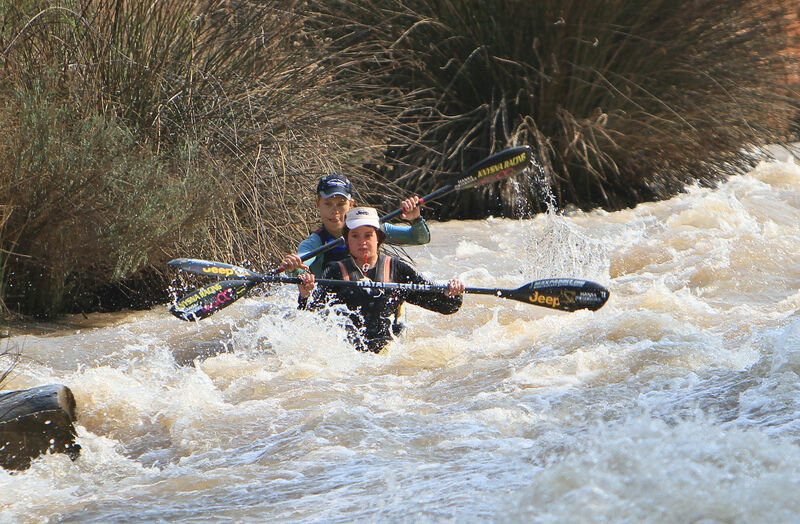 We paddled Knysna Racing Kayaks new K2-The Rush. What an awesome boat! It was fast on the flats, and had ample buoyancy through the bigger rapids plus it was pretty stable! Thanks Albert and Hubby for a cracker of a boat! Having not done too much preparation for this year’s Fish, we were both pretty relaxed in our approach. This went a long way in making this one of the most enjoyable Fish’s I have ever raced. Day 1 went well, we were first out at the Dam Wall Portage, and never looked back. We caught most of B batch, and some of A batch, which proved frustrating as we had to wait many times for slower boats through the narrow upper sections, and going into the portages:( Robyn drove like a champ, and all I had to do was keep in time. We finished 20th overall in the men’s event (*no slip riding) and 1st in the women’s with an 8.5 minute lead over Tiff Kruger and Jen Hodson. Day 2, we started in elapsed time with the men, meaning we could ride their wash. We were 2:48 behind 19th, but we had a pack of 4 men’s boats about 40 seconds behind us. They chased and caught us after about 27 minutes. They had dropped one boat. Thanks to Wayne Wilson and Mark Holtshausen’s hard work we caught the boat in front. unfortunately, they dropped off at Gauging Weir after a bad line leaving us with 2 other boats fighting for a top 20. We were feeling strong, and comfortable in the group. Until we swam at Marlow. It was quick and painless, but enough to lose our top 20. Then another swim at Cradock Weir (yes the crayfish are still at the bottom there) nearly ruined my good mood! We still managed to win by 14 minutes from the other women’s crews. thanks to Robyn for helping me finally achieve a win in this race. Since Daniel Conradie (who won in 1997, and 1998) no other EP person has won the event. He was my mentor and I am glad to finally win the race on the river he took me down for the first time. Thanks to my mom and dad for seconding me, and well done to everyone involved in organising such a great race, and to all who finished it! Robyn, as little as she is, makes up for it by having a huge heart on the river! Great racing! Well done Mich!! Daniel would be so proud of ALL of your achievements!